Tonto Apaches living at The Camp received none of the government assistance provided to other Indians in Arizona. They were not recognized as a tribe, therefore, they were not entitled to reservation land. There were many bureaucratic hurdles to overcome to obtain land for the Tontos. Some help came from town residents who regarded living conditions at The Camp as unsafe and unhealthy. The quest for tribal recognition and land for a reservation began. In 1964 Doris Sturgis proposed to a committee (comprised of a representative from the Forest Service, a Bureau of Indian Affairs representative and Melton Campbell representing the people at The Camp) that a congressional appropriation be requested for the purchase of around 80 acres of private property that could be used in a land exchange with the Forest Service. Many of those living at The Camp were employed in the town. 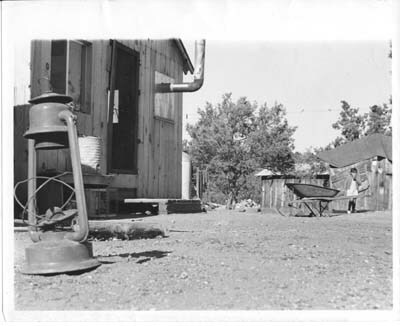 It was important land be acquired near Payson for them to continue working. Land at the south end of Payson was Forest Service land and a parcel across from the Camp on the east side of Highway 87 was considered a good option. If money for the exchange was granted, the land would be taken in trust for the group. The Tonto would then be organized under the Indian Reorganization Act of 1934. This provided for tribal members to be in charge of tribal affairs and their estate, with the Federal government acting as trustee. The acquired land could be owned individually or in common with other members of the tribe. A minister from Oklahoma City, Dale Martin, arrived in Payson in 1965. He experienced a spiritual calling to help the Tontos in their quest for land and established the Full Gospel Mission at The Camp. Martin felt that the group needed a spokesman. A meeting was called to elect one with Melton Campbell being elected. It was not until 1968 that Doris Sturgis’s proposal for congressional action was acted upon. The situation of the Tonto Apaches living at The Camp was introduced to the 90th Congress by Sam Steiger of Arizona. H.R. 18565 called for the “acquisition of a village site (not to exceed 85 acres) for the Payson band of the Yavapai-Apache Indians.” The wheels of government turned slowly. It would be many years before progress to this end was achieved. Attention given to the plight of the people at The Camp resulted in assistance from other sources. In March 1970, a suggestion was made to Sam Steiger that he investigate the possibility of including the “Payson band” in a $5,100,000 judgment awarded to the Yavapai Indians by the Indian Claims Commission. it would open the door for the authorization of funds from this judgement to purchase a village site for the Payson group. It was felt that lineage could be proven through cases of intermarriage between the Yavapai and Apaches living in Payson. The term “Payson Yavapai-Apache band” was adopted for use when describing the Indians at The Camp.